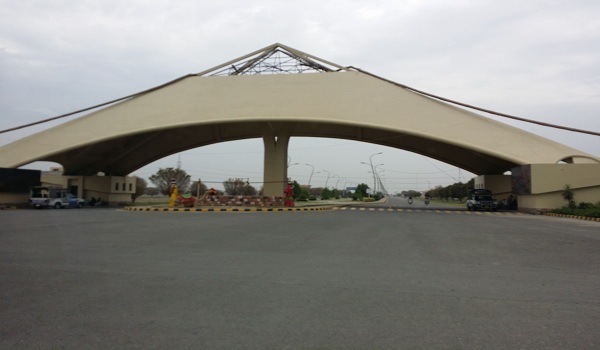 I was asked by a number of readers to shed some light on the impact of the Lahore Ring Road’s (LRR) southern loop on Khayaban-e-Amin, located in southern Lahore in close proximity to Lake City and Fazaia Housing Society Phase I, but I could not confirm the exact route of LRR along or through the society. According to a source who requested anonymity, the LRR was planned to pass between the Blocks L and H of Khayaban-e-Amin without affecting either of the blocks, but later, the route was altered by the authorities concerned, making LRR pass through the society and affecting Blocks B, H and K.
The anonymous source also said that with the recent change in LRR’s route, almost 60% to 70% of the area of Bagh-e-Irum, a housing society located near Khayaban-e-Amin, would be affected. It is pertinent to mention here that an influential person owns Bagh-e-Irum, and he is now trying to use his influence to change LRR’s route to save his society. If the route changes, it will most likely impact Khayaban-e-Amin. Had the LRR passed between Blocks L and H of Khayaban-e-Amin, it would not have affected the society anyway. Those who have a stake in the Khayaban-e-Amin must be massively concerned about the development of the LRR, but unfortunately their confusion is likely to persist for some time and they would be able to heave a sigh of relief only when the LRR’s route is finalised. That said, Khayaban-e-Amin is a reasonable society as far as its development standard is concerned. It features 5- and 10-marla and 1-kanal plots and the developer is yet to hand over possession in some blocks of the society. According to a real estate expert based in Lahore, the current market price of 5-marla plots in the society ranges between Rs 1,500,000 and Rs 3,000,000. The value of 10-marla plots lingers between Rs 2,500,000 and Rs 3,500,000. While the current market value of 1-kanal plots in the locality hovers between Rs 3,500,000 and Rs 7,500,000 – depending on location. That is all the information I could get about the LRR’s impact on Khayaban-e-Amin. If you still have any queries in mind, let’s continue our discussion in the comments section below.